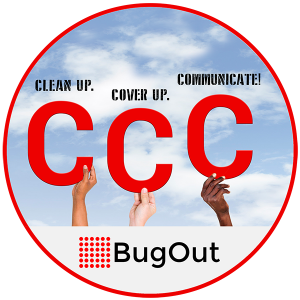 BugOut is implementing an Integrated Vector Management strategy with new community mobilization components that make our program one of a kind. Our core strategy is focused on Aedes Aegypti mosquitoes, but our program covers the full range of vector insects that pose health risks to our population. Accordingly, a majority of our activitites are focused on larval source management (LSM’ – the clean-up of breeding sites, the removal of standing water, and public education and participation in the elimination of mosquito breeding habitats or egg-laying locations), minimally-required chemical interventions (we’ll only use chemicals when absolutely necessary, and even then so, only in accordance with our Steering Committee’s requirements that the chemicals be those approved for use within the BVI and that have been cleared by leading regulatory agencies in the world, like the US EPA). 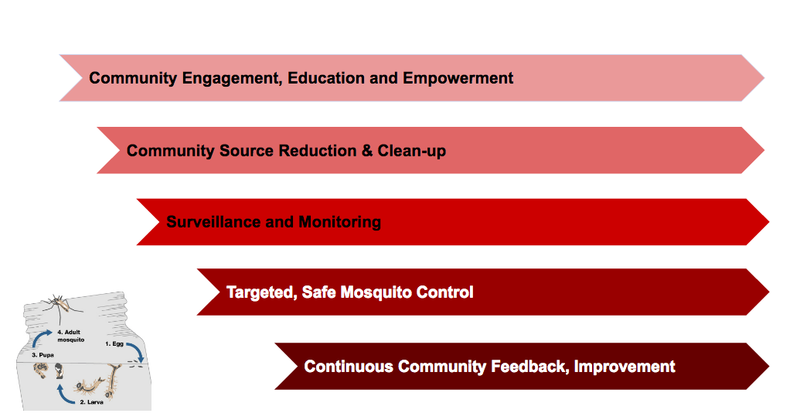 A bulk of our strategy rests with BugOut’s Community Vector Control Officer program and BugOut’s Community Mobilization Program, driven by BugOut’s Precinct system, volunteers, and our network of committed Virgin Gorda residents who are taking up action against mosquitoes. Community source reduction and clean-up: Experts have established that mosquito populations can be reduced by over 50% through the reduction of breeding sites alone (from standing water and other areas). BugOut has been energising the community to take part and organised community clean ups and will continue to do so throughout the program. Surveillance, Monitoring and Data: We will establish baseline data about existing mosquito populations and threats, and work with citizens and landowners to create a clear and ongoing picture of mosquito presence and the success of ongoing and/or future control programs. Aggressive Mosquito Control: Driven by a BugOut Work Force of Community Vector Control Officers, Advised by some of the world’s best minds on mosquito control efforts, we will work with the BVI to deliver effective, state-of-the-art, and environmentally safe mosquito control efforts. This may include a range of control or abatement methods, including larvicides, adulticides, auto-dissemination applications, spraying, bait-and-kill, vaporizers, land clean-up, removal of standing water, repair of infrastructure, and other efforts. Learn, Improve, Repeat: We will monitor programs closely, adjusting to improve where necessary, and expanding on parts of the program that work well. As a privately-funded effort, BugOut provides flexibility and speed in implementing a flexible mosquito control program. We will share our lessons, too, so that others can benefit from our experiences. 1. Precinct Operations – we develop strong precincts led by trained volunteers to distribute knowledge, know-how, resources, and alerts on an ongoing basis, and to provide BugOut with a granular, ongoing view of conditions and dynamics. 2. Annual House-to-House Baseline Survey – we conduct an annual baseline survey every year of every parcel on Virgin Gorda, and update it on a quarterly basis; this survey scores each parcel based on larval breeding sites or potential breeding sites; the baseline survey is mapped and guides our subsequent control efforts. Parcels are visited each week until each parcel is at “zero” on breeding site presence. 3. Ongoing Surveillance and Monitoring – we pursue ongoing surveillance methods, house-to-house efforts randomized and systematic methods so that we continue to suppress hotspots, inspect parcels, and continue to eliminate breeding sites. 4. Targeted Suppression – we conduct surge efforts at various times in the year to address ongoing or recurring problem areas. 2. Pregnancy Support Kits – we provide pregnant women with bed nets, insect repellent, special inspections and larval site reduction/elimination at their homes and within a certain radius of that parcel. 3. Adult Mosquito Outbreak Response – we respond with fogging if and only if we believe that it would provide superior control in a short time that cannot be achieved by any other measure. 1. Traps: we use certain mosquito traps, upon evaluation, to serve as both monitoring tools and as lethal control tools. 3. Biological Control Methods – we employ biological control methods once we’ve determined particular applications can be helpful in controlled scenarios. 4. Others – we may in the future employ additional chemicals, as needed, and as approved by Steering Committee.